NCAA looking at intern Rubio's trip with coach Lane Kiffin. 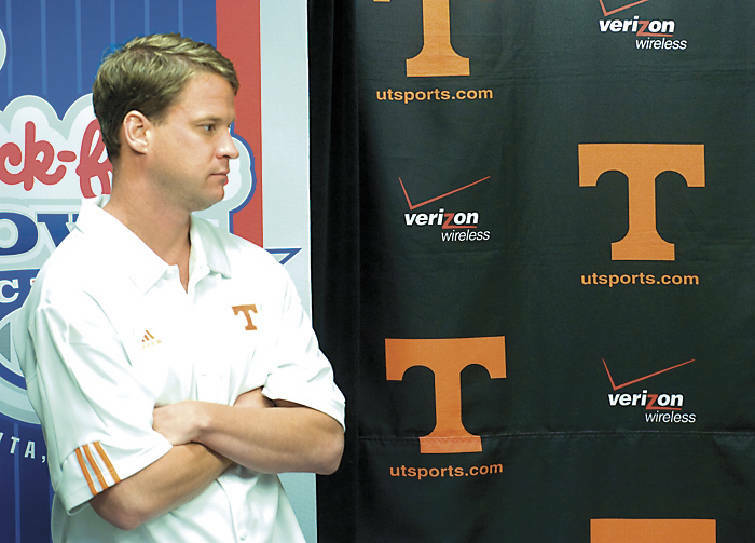 Tennessee head football coach Lane Kiffin stands to the side Thursday before answering questions on the upcoming Chik-Fil-A bowl and recent reports of a possible NCAA investigation into the football program. KNOXVILLE -- A new potential Tennessee football recruiting irregularity surfaced Friday night. UT officials confirmed news initially reported by the New York Times that the Southeastern Conference is examining a recent recruiting trip to South Florida. The SEC has requested information about UT recruiting intern Steve Rubio's recent trip with head coach Lane Kiffin. Rubio, who is not one of the staff's designated off-campus recruiters, would have committed an NCAA violation by recruiting with Kiffin at Fort Lauderdale's St. Thomas Aquinas High School. Athletic director Mike Hamilton told the Times that the SEC's concern was whether Rubio assisted recruiting efforts or contacted players during the trip. Hamilton told the Times he was not aware of any proof that Rubio recruited during the trip, and that UT offered the SEC all the information it requested. Hamilton told the Times "someone else (would) make that determination" of whether to forward the Rubio situation to the NCAA. The Times wrote that Rubio graduated from and volunteered at Aquinas earlier in his career. UT is also dealing with an NCAA review into a trip two Orange Pride student ambassadors took to a football game in South Carolina earlier this fall. Kiffin said Thursday he was not aware of any UT wrongdoing in the Orange Pride matter, but the NCAA could view the trip as illegal recruiting by nonsanctioned UT personnel.